It’s common enough to see wine at author readings. But when Fayston’s Janet Hubbard reads from her debut novel at Phoenix Books (Essex) this Thursday, browsers will be able to buy glasses of Champagne, Prosecco and New Mexican Gruet. The sparklers are de rigueur: Champagne: The Farewell, is a murder mystery set in the Champagne region, with the members of an elite wine-making family as central characters — and suspects. According to wine journalist Nicholas Faith, who provides the book’s epigraph, the “farewell” is the taste Champagne leaves “at the back of the throat after it has been swallowed.” The novel’s title, however, also refers to a nastier send-off: After the wedding dinner of her niece, pregnant Champagne heiress Léa de Saint-Pern suffers a fatal blow to the head. Was Léa killed by her younger, American lover? By the German businessman who hoped to buy her winery, or the relations who wanted to keep it in the family? Sorting through the long list of suspects and solving the case falls to two wedding guests: examining magistrate Olivier Chaumont; and New York police detective Maxine “Max” Maguire, a two-fisted stunner with ancestral roots in the French aristocracy. Naturally — with all that Champagne around — the two sleuths experience some romantic friction. Hubbard’s heavy prose doesn’t match the effervescence promised by the title, and keeping track of the many characters and their entanglements slowed this reader down. Max, who’s supposed to be equally tough, gorgeous and vulnerable, never quite comes to life the way great detective characters do. But the author has clearly done her homework on the French judicial system — and, for some readers, the premise could prove irresistible. They should know that Champagne is just the first in a wine-themed “Vengeance in the Vineyard” mystery series — and that Phoenix will provide cheeses to go with the bubbly. 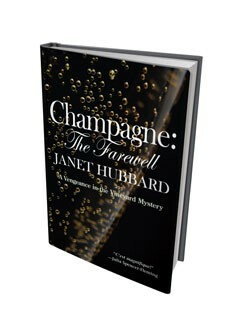 "Champagne: The Farewell" by Janet Hubbard, Poisoned Pen Press, 294 pages. $24.95 hardcover, $14.95 paperback. Hubbard will read on Thursday, September 27, at 7 p.m. at Phoenix Books, Essex. Free with cash bar.